Pastor Artur Pawlowski and members of his flock march at the head of the Calgary Stampede Parade on Friday. Below: Pastor Pawlowski with Alberta Solicitor-General Jonathan Denis. Below that: Pastor Pawlowski with Prime Minister Stephen Harper. All photos grabbed from Facebook pages belonging to Pastor Pawlowski or his Calgary Street Ministries. Artur Pawlowski, Calgary’s most turbulent priest, managed to march with his eccentrically dressed supporters right at the front of the 100th anniversary Stampede Parade on Friday. This should be news, because the normally omnipotent Calgary Stampede Board didn’t particularly want Pastor Pawlowski to be there – in fact, last year they tried to get a court injunction to prevent him and his flock from protesting along the parade route. Don’t expect to see or hear much coverage of this oddity, however, because the Calgary media have an unwritten policy of never saying anything even mildly controversial about the Stampede when its gates are open to paying customers. Publicly speaking ill of the Stampede is considered sacrilege in what used to be known as Cowtown, even if that means journalists must take with good grace the obvious disdain of Parade Marshal Ian Tyson. Alert readers will recall Pastor Pawlowski, the noisy street preacher who has been accused of breaking Calgary bylaws more than 70 times over the past few years, as the man who prompted a particularly intemperate Sun News Network commentator to call Mayor Naheed Nenshi an “anti-Christian bigot” when city police stopped the preacher from conducting a private religious ceremony inside city hall. Never mind that Mr. Nenshi had nothing to do with police being called to that particular disturbance back in December 2011. 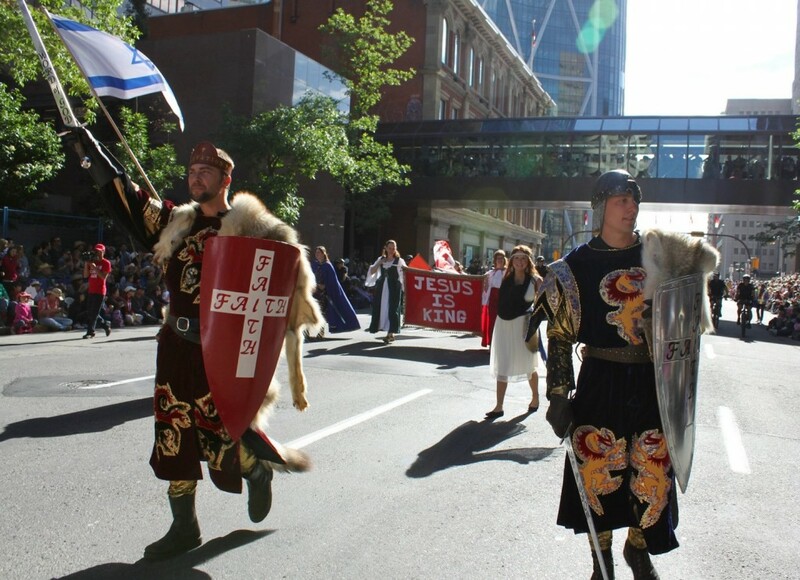 At the Stampede Parade on Friday, Pastor Pawlowski and members of his Calgary Street Ministries appear to have showed up moments before start time with their Canadian and Israeli flags. The Calgary Police let them join the fun, right at the front so it could be said they weren’t technically part of the event. Perhaps the officers didn’t want to be called the “boys with the billy clubs” again, or anti-Christian bigots, an accusation that is thrown around with cheerful abandon in the Alberta of 2012. A little way back down the parade route along with Premier Alison Redford and Mayor Nenshi came one of Pastor Pawlowski’s apparent supporters, Alberta Solicitor-General and Justice Minister Jonathan Denis. It’s not clear how Mr. Denis felt as the province’s chief law enforcement officer about Pastor Pawlowski’s unauthorized presence at the head of the parade. But notwithstanding the pastor’s frequent problems with the law – mostly tickets for noise bylaw violations when conducting services in public – Mr. Denis, the MLA for Calgary-Acadia, was not inclined to ignore Mr. Pawlowski’s support during last spring’s tight-fought provincial election. Just before the election, Pastor Pawlowski delivered a little succor to Mr. Denis’s Progressive Conservative party, which was being strongly challenged by the far-right Wildrose Party led by Danielle Smith, who casts herself as a defender of Christian values. It remains to be seen if Mr. Denis will write another letter to Pastor Pawlowski thanking him for his contribution to this year’s Stampede Parade.